KIALOA has built innovative Outrigger, Dragon and SUP paddles for over 24 years. Their mission, according to Jim MIller, KIALOA’s director of new business development, has expanded as ,”producing the best products for paddlers through innovative design, selective materials and a lean manufacturing process.” This summer they unveiled the inflatable Waikiki and Napali which join the initial soft top Aloha. As we build our newest business here at Elder SUP we looked for sponsor support from companies with a mission and culture aligned with ours. We were fortunate to have the support of Sweet Waterwear – and KIALOA Paddles. We admire and respect the way KIALOA employees live like they paddle following the guiding principles of their core values: Po’okela (excellence), Laulima (teamwork), and Malama (stewardship). We aspire to have these same qualities drive our decisions and actions as we grow P2SUP. Just as the KIALOA team appreciate those who have helped them along the way, we appreciate KIALOA and wish them all the best. Meanwhile, it’s time to get out on the water on our 12’6″ infalatable KIALOA Napali. My favorite young paddling buddy, Julia, joins me on the Aloha soft top. We are out to have some “clean up the river” fun. This article would not be complete without a story from KIALOA’s own, Meg Chun. Here is the story that goes with this amazing video example of the spirit that drives the people and the company. TEAM KIALOA 2015 from FocalBoxProductions on Vimeo. The reality is that by choosing to move ourselves across, over and through the magnificent waters of our world via a board and a paddle we have chosen to be self-powered. That sets the stage for a number of metaphors. Does it inspire you to share your story? Share why you chose SUP or any other power-related tale- we’re interested. We have one section of this site dedicated to SUP Muses. We define SUP Muses as a category of SUP influencers whose stories inspire! Do you know a SUP Muse like Candice Appleby, Karen Wrenn, Suzie Cooney, Heather Relyea Baus or Brit Oliphant – let us meet them. This next piece is from their website: Born on the Island of Oahu in 1991, KIALOA Paddles grew out of Dave Chun’s love for the sport of outrigger canoe racing. Driven by the desire to build the best paddles in the world, Dave started crafting wood paddles on his parents’ lanai. Shortly thereafter, he met Meg, a mid-westerner transplanted to Hawaii. It was a marriage of west and east, island heritage and mainland progressiveness. The Chuns moved the company to Bend, Oregon in 1992, bringing the Aloha spirit with them. 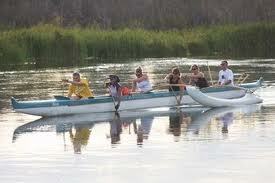 Against all odds, they started an outrigger club in the High Desert. 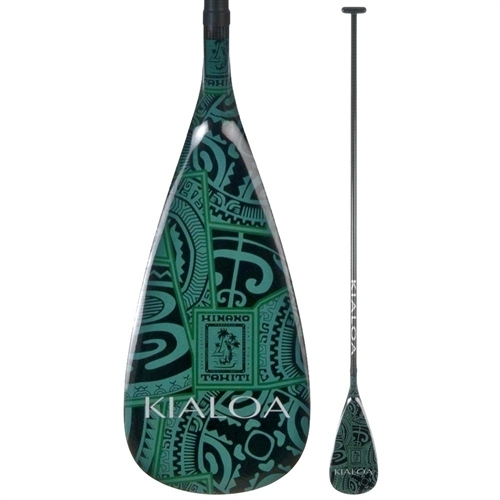 Nowadays KIALOA makes a full line of stand up, outrigger and dragon boat paddles. 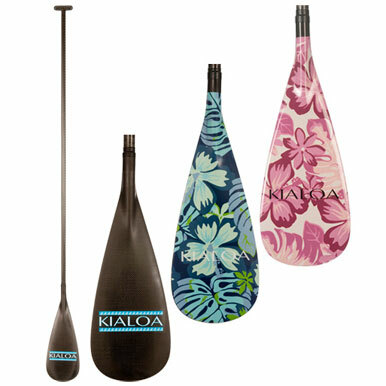 As a KIALOA Paddles E’lele (ambassador) I take my role with a grain of fun and plenty of listening – to all of you! I believe that as a global water loving “family” we can accomplish our mission to preserve our planet’s waters and help move them to be even more healthy. One of the cornerstones of the Kialoa vision is Malama: Stewardship. SUP Insights: Dave Chun & Aha! Prepping for the Naish Gorge Paddle Challenge a few weeks ago the goal was to increase my speed over a 5 mile distance. Little did I realize how insane the upwind legs of the Sunday course race would be – 4 gnarly laps! The training I did was adequate – but the level of fatigue I had over the next week pretty much let me know that I pushed my limits endurance-wise. Even with the great advice shared by Candice Appleby before the race, I knew I wasn’t getting every ounce of speed or power from the efforts of my paddle strokes. It wasn’t until I got back home and went out for a training session that the most valuable insight of my weekend at the Naish Gorge Paddle Challenge really hit home. I had been hanging out with a group of people all chatting in the KIALOA Paddles tent before the awards on Saturday. A few strong looking paddlers from Vancouver were asking Dave Chun about which paddle to add to their KIALOA quiver, As it usually does with Dave Chun, conversations about paddles tend to morph into conversations about design and technique. He’s so passionate and knowledgeable about every aspect of his life’s work he simply can’t help it. The guys were skilled at both outrigger paddling and standup. So in the explanation, Dave was comparing and contrasting body position, stroke and technique. Always eager to learn more I listened like a fly on the wall. It seemed that recently I’d honed my reach and blade entry into the water, but there was always room to refine things even more. All the phases of the stroke have to work together smoothly for the stroke to be efficient and without good reach and catch, the stroke won’t be effective. Dave was explaining aspects of the “catch.” The “catch” is the point where the blade is fully buried and locked onto the water. It is natural that the stroke begin as you begin to put the paddle into the water. You will naturally begin to pull on the paddle and begin to apply pressure to the water with the blade, even before the blade is fully buried. SO, it is important to “bury the blade” relatively quickly. The paddle should not “float” down to the water. Reach and drive the paddle into the water and make the catch as far in front of you as possible. Since ALL of the stroke is in front, and never behind your body, the more in front of you that the paddle gets fully buried and makes the “catch” the longer stroke you will have! While I don’t always execute the reach and set-up, followed by a great catch, I had heard this before. What I never “heard” before was a key bit of information. Dave explained that a mistake that’s sometimes made is to begin pulling the paddle back or attempting to begin to drive the board forward before the catch has been completed. It’s a brief second of time, but important to fully execute the catch before moving through the paddle stroke. The focus should be on entering the water smoothly and quickly with the paddle edge slicing into the water cleanly, creating minimal turbulence. Once the blade is fully submerged and “planted” it’s time to apply the power. If you start pulling too soon, the blade tends to cavitate (air bubbles form along edges of blade) and will slip through the water instead of holding. Paddling in wind, paddling currents upstream and down all make it difficult to really determine the impact on speed or efficiency that a single change might deliver. Yesterday as I did my 60 minute training session I picked a section of the river that would be somewhat consistent over the hour. Wearing a heart rate monitor I did 1-mile loops up and down stream. The miles flew by, maybe because so much concentration was going into refining that catch and “plant.” In any event some things were both cool and surprising. My average time per mile was about 25 seconds faster. My heart rate per minute was 5-8 beats per minute slower. That led to a perceived exertion that was less – while going faster. My limitation when racing is usually central (my heart rate rockets off the chart) before my muscles beg for relief. This was fun! Our sport can keep us refining skills and learning constantly – and that’s just one more thing to get us back on the water working hard again and again and again. Watching golf with my husband, we chatted about clubs and choices and using the right one for the shot – and the topic turned to paddles! I needed to make a choice or two and start to grow my quiver of paddles. Would the “right” paddle catch me more waves, shoot me ahead in races and generate more fun on the water? Now, I am realistic enough to realize that my skill level just isn’t going to magically improve with a paddle – but it sure can help! NO matter what your skill level, it is very important every once in a while to recharge. It’s vital to get yourself to that next level with tools or training or resources in order to reach the competitive edge or proficiency that can make your sport more fun. We’ve all heard, “It’s the Indian, not the arrow.” Of course your individual skill that matters far more than the equipment you use. That said, it was time for me to retire a vintage paddle and take advantage of new technology. 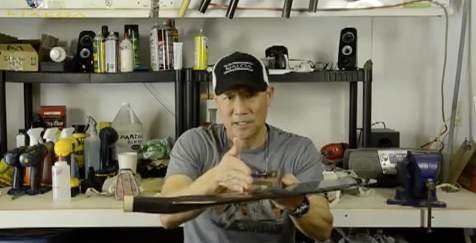 Fortunately, Dave Chun was available to give me some guidance on my decision to get a HULU Ultralight GL paddle, he knew it was exactly what I wanted. The question was, what size should it be? I had the adjustable paddle about 1/2 inch longer than my usual paddle. We decided that small of an increase in length was not worth the potential for a change in my forearm, elbow, shoulder comfort I’ve had for the past 6 years. Paddle stroke technique seems to be trending toward more rapid turnover – more strokes per minute rather than long, hugely powerful pulls through the water. At last! I ordered my HULU and learned much about building out my quiver. Today it was about the arrow, not the Indian – Getting jazzed, taking time to explore options, taking time to go to the training and listening to the advice of an expert. 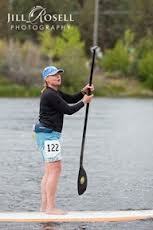 These things can be extremely powerful in mentally advancing your enjoyment of standup paddling. OH! For enjoyment personified, take a look at this video created by Washington state pro paddler, Beau Whitehead. Just took a virtual tour drooling over the Naish line of Glide raceboards (have you ever seen that GX? Yeah! )and Mana line of SUP surfboards. It seems like forever until we head to Maui for some surf and downwind fun at the Olukai Ho’olaulea. In reality, it’s just about 100 days. With so much snow and ice on our local paddling locations, we are waiting until late May to get our Naish boards. Meanwhile we prep and dream. I did have the pleasure of going a few miles in the Deschutes River on a recent 50 degree afternoon. It was the first time I’d paddled since our fun in Maui in early December. Other locals, like Randall Barna paddle regularly – every freezing month of the year. I was paddling on my Amundson 11’3″ all round fun board. Everyone knows that I have had endless hours of flatwater and surf fun with that board. Heading up river on a calm day I was surprised to notice – my Amundson just didn’t have that “glide!” In Maui we had been blessed with a few glassy days with small surf so the actual glide of the Naish 14′ Glide was obvious. A set of 6-8 strokes on one side generated some serious acceleration with minimal effort. It reminded me of some technique suggestions from KIALOA paddles’ Dave Chun. 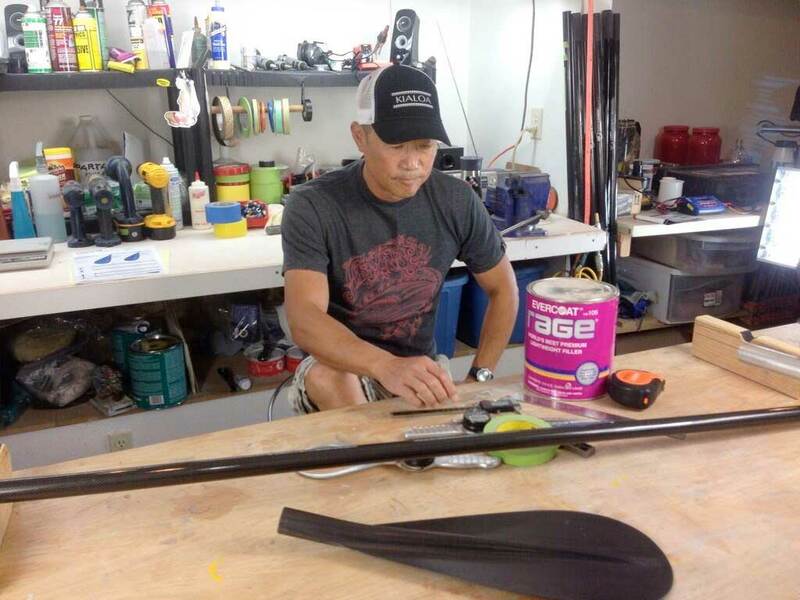 When asked about paddling technique, Dave Chun says, “Listen to the board, Don’t worry about what you look like. Listen to the water coming off of it. 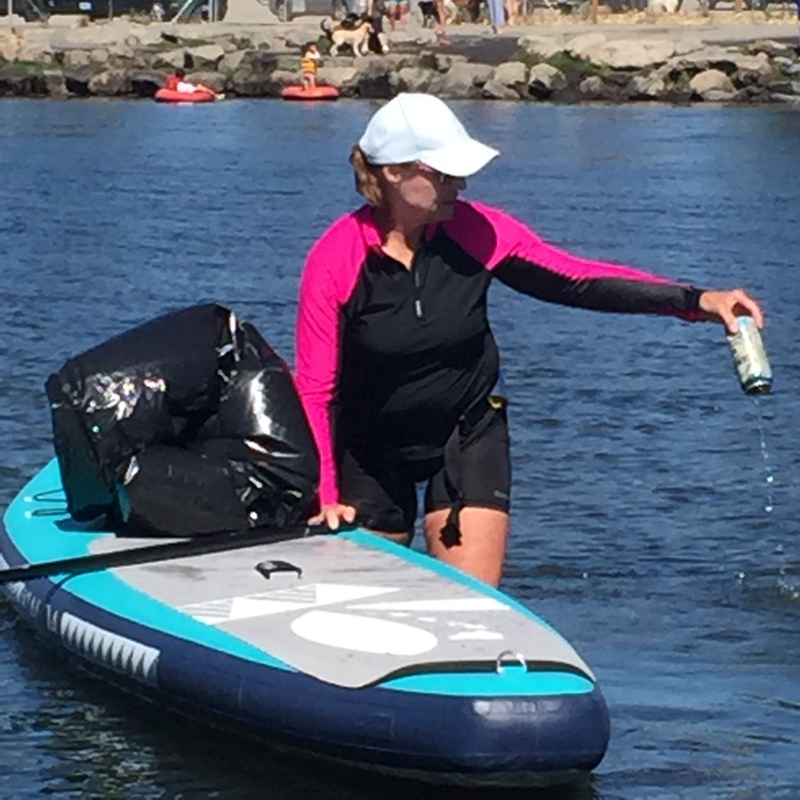 Feel what makes it go fast and smooth.” I was doping that observation during my January paddle and realized how much the design of a board impacts the glide, the sound and the result of a series of paddle strokes. Even though I love the sound of the chop-chop-chop as the bow skims across the ripples in river current and breeze bumps, having aboard that slices right through all that with more of a “swish” is simply faster! So glad we’ve got a 14′ Naish Glide reserved for the Ho’olaule’a. 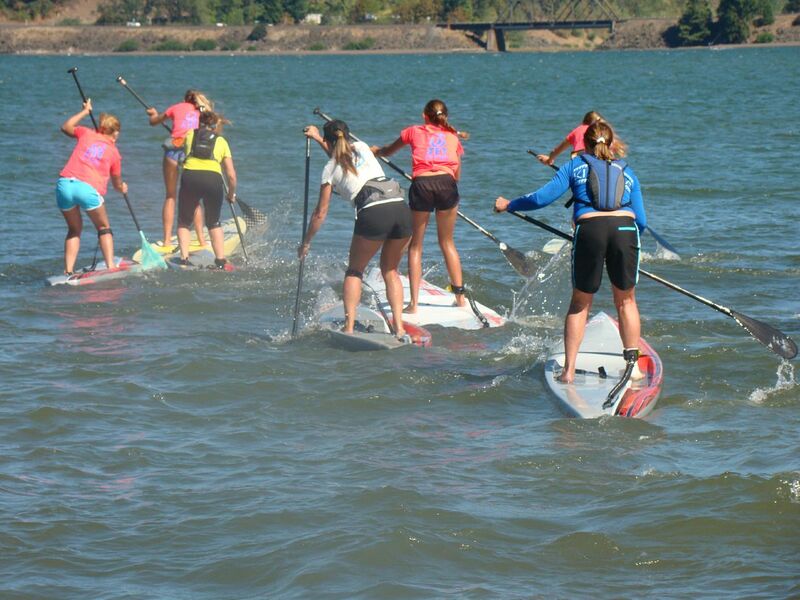 While a great board is key to having a great experience during SUP events, the bottom line is getting ourselves ready to be strong, safe and prepared for the physical and mental challenges. To that end we have been poring over Suzie Cooney’s SuzieTrainsMaui website for ideas and training tips. Luckily she has SKYPE sessions available for some true custom training opportunity. I know we will be filming some sessions with the GoPro to get solid feedback that we need. “I do a lot of cross training in the gym in the Winter. Circuit training is great because you can get your heart rate going, build muscle and muscle endurance. I will first do something that elevates my heart rate followed by a couple exercises that include strength and balance. For example, I might do 20 double jumps (or you could do 100-150 single jumps) with a jump rope and then move right into 20 kettle ball swings (from a squat position swinging the kettle ball to shoulder height coming to a standing position) and repeat. Then I would move into a plank position with elbows on a ball and roll the ball forward and back for 20 reps. I would do this circuit 3 times and then move on to another circuit. Another idea of a circuit is to do 15 split jumps on each leg (http://www.livestrong.com/video/5310-split-jumps/) and then 20 tri-cep dips then 20 reverse crunches (http://www.youtube.com/watch?v=vVVlXA0dqGg) and repeat this circuit another two times. Basically, come up with some circuits of three exercises. Have the first exercise of the series be something that will elevate your heart rate ( jump rope, running stairs, sprints on a rowing machine) add a strength exercise (kettle bells, push ups, tricep dips, pull ups, etc…) then add in a core exercise ( reverse crunch, plank, medicine ball sit up and throws). After you finish one circuit of three then move on to another. Excuses for not getting ready? NONE! Have fun, just be sure to be safe and paddle with a buddy when the water and weather is cold. Yesterday was one of those days. I have a complete re-write of my PA Pharmacy (day job) website on-going and the energy wasn’t translating so well. At an early morning break I came across a welcome e-mail from KIALOA paddles.They shared a new video that was hard to resist with this introduction, “Straddling the line between creativity and insanity, you are just as likely to hear a discussion on His Holiness the Dali Lama and the merits of Heavy Metal, as one on hydrodynamics and higher design when you visit the shops of Gerry Lopez Surfboards and Dave Chun’s KIALOA Paddles. I am so fortunate to live in Bend, OR where both of those uber-cool guys have their shops. Added to that is the occasional opportunity to experience a yoga class at Groove Yoga lead by Gerry Lopez. Maybe that proximity to the Dave-Gerry blend of creativity/insanity made me particularly susceptible to the philosophy of the video, maybe it was just a stellar day outdoors when my head was all mothballs and dust. Whatever the convergence of luck would have it, watching that video changed my day. Take a look for yourself. Not 45 minutes later I was at Groove Yoga sweating through exactly the class I needed. With my trusty Amundson surfboard on the roof rack, class was followed by a short drive down to Lava Camp and the river launch spot just upstream from Benham Falls. Ahhh, breathing in that crisp air while applying massive amounts of sunscreen was just what I needed. I took off upstream planning to go about 4 or 5 miles before turning around for a down-current ride back. No problem, it was an unexpected play session smack in the middle of the work day. Music in my ears consisted of a playlist created by my 10-year-old granddaughter, and it kept me smiling. About 90 minutes into the paddle I hit the 4 1/2 mile mark (GPS and mileage by Nike+). A quick turn and I was soaring back downstream. The easier paddle back allowed lots more time to let the endorphins and the views kick in. Did I hit the office with enthusiasm later that afternoon? You bet! The day allowed me just a couple of hours of work but it was productive – or maybe my mindset imagined it so. In any event, nothing was lost by the hours of escape from routine and some sweet river diversion. Thanks to Dave Chun and Gerry Lopez for the inspiration and license to play.